This is a retrospective build story. The wife and I decided to build a house back in 2010, so this is the story of how we bought the land, and completed the build in several stages. For those wishing to simply skip to the end, the build was finished in March 2017, and landscaped shortly thereafter. A bit about myself. I've been coming to Thailand regularly for work for almost 18 years. I've been with the same Thai woman for nearly 13 years, and we trust each other implicitly. So lets dispense with the "her family is trying to rip me off" stuff at the start. Should something happen to her, and since I cannot own land in Thailand, I have taken necessary legal precautions to protect my investment. Lets leave it at that. As I knew I planned to retire in Thailand, Mrs. Chapstick and I decided to start looking for a property in 2010. We wanted to leave near the ocean, and neither of us had a desire to live in Pattaya proper. However, the area south of Pattaya was intriguing, as it afforded access to shopping and healthcare that Pattaya offered, without the big city downsides. So we quickly focused on this area. We looked a A LOT of stuff .... both existing houses and lots. I would have preferred an existing house, but I really didn't like anything we saw. Houses were either poorly built, over-priced, or in a poor location (or some combination of the three). We both had some pretty specific ideas of what we wanted, and eventually focused more on lots we could build on. The problem with buying real estate in Thailand is the opacity of the process and thus, the opacity of the market prices. There are numerous properties that are offered "for sale" (including a sign) where the owner really isn't interested in selling, but would gladly accept an offer that is well above market. So if, say the market is 3mm per rai, they will price it at 5mm. If the market rises to 5mm, they raise the asking price to 7mm. So you really have to ask around a lot. Some real estate agents are useful to talk to, but most are not. It was also helpful to have Mrs. Chapstick scout locations and ask around without me. She spent a lot of time talking to anyone and everyone in Baan Amphur, Na Jomtien, Bang Saray, and Sattahip about land for sale. Finally, in 2011, we stumbled across a property with a motivated seller in Bang Saray. It ticked all the boxes ... town not too big or too small, level lot, rectangular size, 1 rai. Some negotiation, and we agreed upon the price. Had the land office stake out the property, reviewed the chanote, and closed within a month. Our next process was to build a wall, and add soil. The property was slightly below the road level, and we anted to raise it above that level. I could have just put in dirt and waited for it to settle, but I didn't want the fill to just wash away. So we had a stone wall built. For some reason, my photos of that process have gone MIA, so you will have to trust me on this. Once the wall was built, it was time to add soil. My initial thought was to add about 0.5 meters of soil ... Mrs. BC had different ideas and proceeded to add about 1.5 meters. My bad for not being clear with her before we build the 2.5 meter wall. Oh well, we'll deal with this later in another installment. Anyway .... I bring you to the first photo. Finished wall, added soil. Then we waited while the soil settled. Last edited by rchapstick; 26-08-2017 at 08:01 PM. Hmmm, this process of adding photos is more cumbersome than I thought it would be. Next order of business was to come up with a house plan. We looked at the government house plans you can get for free online, but we didn't find anything close to what we wanted. So we started looking at architects. Architects, like builders in Thailand, often come in one of two flavors: absurdly overpriced or incompetent ... often both! The process is then to interview anyone and everyone you can find that has built a house to find a decent and reasonably priced architect. 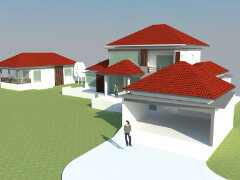 After lots of discussions, we decided on a young-ish guy who had designed a couple of houses in Sattahip. He was reasonable, and his customers said he was easy to work with. The plan was to build a property with a guest house, and build the big house later, when I retired. I had also seen properties that had a separate "system room" that housed the electrical and water (not together). Without getting into too much detail of the process (largely driven by our individual requirements, this is what we came up with. Once you have a plan, you need to get your plans approved at the local municipal office. In Bang Saray, this is further complicated because much of the land, including ours, is "Navy Land" ... meaning it was once given to someone who served in the Navy. So we also needed to get approval of the build from the Navy. Both are straight forward, though lengthy, processes. While we were getting the OK, we started interviewing builders. Most builders will hire literally anyone off the street and call them a construction worker. Skilled tradesmen are rare. Anti-defamation laws really restrict you from saying anything bad about your builder, no matter how true. So, in my opinion, the key to finding a good builder is to talk to as many people as you can that have built a house, privately, and ask about their experiences. Visit their house. have your Thai spouse talk to their Thai spouse. You also need to understand how houses are built in Thailand. It is not the same as in farang land, due to the climate and the humidity. You really need to do your homework on all of the major components of a build to understand and manage the process. Obviously, this forum is a good source of information. While the workers are all Thai (or Cambodian or Burmese), the owners are sometimes farangs. Some are good, some are not. Once you've narrowed down your search, you need to ask some specific questions of the builder. Who will be on site every day? Who is the foreman, and how long have they been with you? Who is on the crew, and how long have they been with you? Also, if you are away sometimes, as I was, you need to know how they will communicate with you and with your Mrs. Do you have someone else that will help you, and how with they communicate with you. Lastly, if you are lucky enough to find a decent builder, then you have to find out when they are available, and how that works with your timeline. Let me say up front that I was extremely lucky to find my builder ... a Thai guy and his nephew out of Huay Yai. He spoke decent enough English, but more importantly, he was fanatical about the quality of the build. 80% of his crew had been with him for more than 5 years, and his foreman had been with him for nearly 10 years. He had stellar recommendations from several references (thai and farang), and he was available. Pricing was not the cheapest, but not even close to the most expensive. I have, and would recommend him without reservation. One other point to make on project management. An engineer needs to sign off on the design of the project, and is also supposed to sign off on the the actual build. Most builders employ their own engineer, and will usually rubber stamp whatever their boss wants to do. However, I insisted that the engineer report to me, and I specified points in the build that he would inspect (pilings, footings, steel for structural beams, etc.) > I also got an electircal engineer to review the electric plan, and to inspect and sign off at a couple of points during the build. My builder had no problem with this, and it was money well spent, if but of piece of mind. It was funny reading about your land buying experience. I encountered the same last year looked at places for "sale" agreed to the price then later was told sorry not for sale anymore. I guess you just have to be ready with your money for the seller to be motivated. looking forward to some pictures of your place. Decent solid looking perimeter wall, smart move getting that built first. Looking like a decent construction thread, good work. First stone wall I have seen in Thailand...great! This sorta thing was explained to me as something like "if you agreed to their price, they think they must have undervalued it". So they put it back on the market at a higher price. Right up there with if you show too much interest, the price goes up. Drove me nuts, I learned to stay out of the whole looking for land / negotiating BS. Not wishing to steal the OP's thunder but I estimate around 200mm.